Meet the Pocket Tripod. Docks at a consumer electronics show are common as long as it involves a speaker, but this isn’t one of those. It’s kind of funny since CE Week mostly features gadgets and electronics but the item that quickly became one of my favorite gadgets didn’t require power at all. As the name states, it’s a tripod that fits in your pocket! Seriously, this thing is portable as hell. Coming off a successful Kickstarter campaign last year, Geometrical Inc. and designer Rambod Radmard decided to showcase the little invention at CE Week. After close to two weeks of using the thing, I decided to finally share my thoughts…and yes, I know it’s technically not a tripod. At first glance, the Pocket Tripod is unassuming. 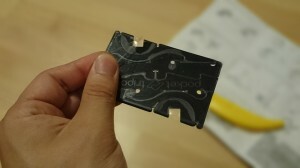 Unless you knew what it was, any person would easily mistake it for one of those slim profile wallet knives. Well, in my opinion, it’s just as handy as one. The device is really ingenious. It’s simple, quirky, and handy. Once opened, the packaging itself serves as a fold-out instruction book which include many awesome-simple pictures. 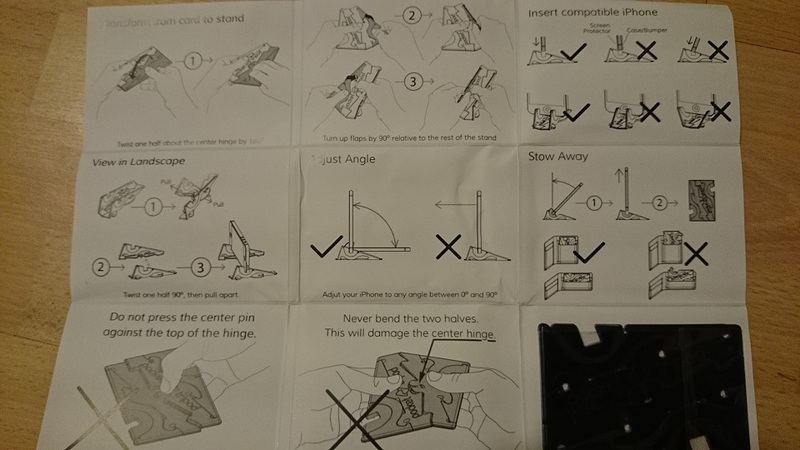 The black item you see in the lower right hand corner of the packaging/instruction-printout is actually the tripod itself. Just pull it off, peel off the protective plastic skin and you’re off. The easiest way to set up is the portrait orientation. All it takes is a single twist of the tripod down the center then flipping up the corners. If the viewing angle isn’t great, just grab your already docked device and slide it to the desired angle. 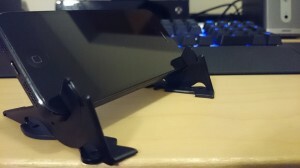 There is ample friction between the slot where the device fits and the stand portion itself. 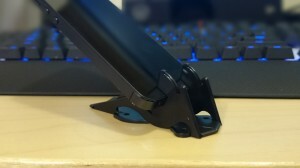 I’m not sure what else I can really say about the Pocket Tripod other than that it is a brilliant, portable dock. 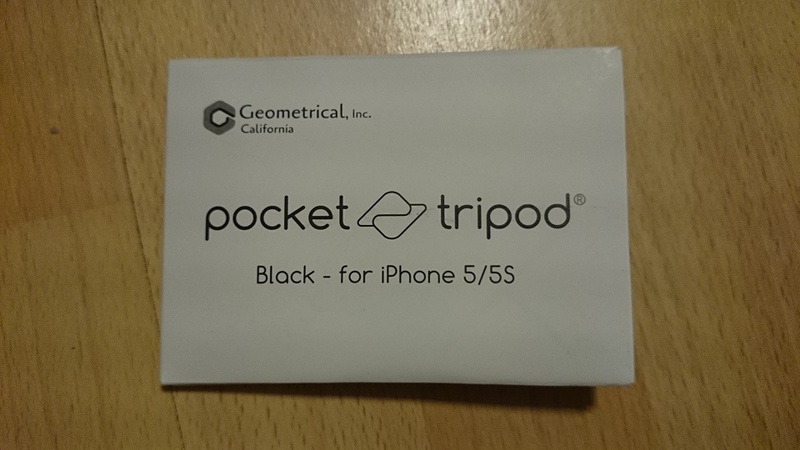 It does literally fit in your pocket or your wallet when travelling. 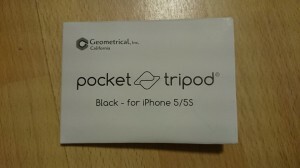 Currently, it can be purchased directly from the Pocket Tripod store. MSRP is $25. The website is heavy on the iPhone compatibility but it does work with most major handsets such as the HTC One M7. The Fit Card, which is included, can be used to measure your device’s thickness in tandem with your favorite case/bumper to ensure maximum compatibility. Incidentally, if you’re on the fence about purchasing the Pocket Tripod, the Fit Card can be purchase separately on the website for a nominal amount ($0.99). Don’t get me wrong. While I think of the Pocket Tripod as the darling of CE Week, it’s not perfect. However, Geometrical Inc. and the mastermind behind the product, Rambod, promised broader compatibility with more devices and cases. In addition, I’m sure some of you will be wishing for an easier way to manage between landscape and portrait but because of its extremely compact form factor, I can easily forgive the dock. In my humble opinion, the dock is worth the price. I’m looking forward to improvements and expansion of the product line in the coming months.